Hamilton versus Massa. Who will win the big prize in F1 2008? This weekend is the big event. After seventeen rounds of this year’s highly competitive and controversial Formula One season, two drivers are on the verge of winning the drivers’ title in Brazil. Like last year, Lewis Hamilton will have the advantage with a seven-point lead over title rival Felipe Massa, but will history repeat itself come race day on Sao Paulo? This is Hamilton’s second opportunity to win the drivers’ championship, as back in 2007 he missed out due to cracking under the pressure by first trying to desperately get pass his then McLaren team-mate Fernando Alonso on the opening lap, and later suffering a rare gearbox malfunction as Lewis tried to regain lost ground. The Briton lost out to Ferrari’s Kimi Raikkonen, who took the title against all odds by a single point. This time, Lewis Hamilton has vowed to take a relax approach and following his dominant performance in Shanghai two weeks ago, the Briton will have the upper hand as he only needs to finish fifth or higher to take the crown. If the McLaren is reliable and the new aerodynamic body kit – featuring a revised rear-wing – provides extra confidence to the driver, then you will see a British world champion since Damon Hill back in 1996. If Lewis Hamilton manages to win the title, it will be his lifelong ambition being fulfilled and he will become the youngest champion in the history of Formula One motor racing. As for his opponent, Felipe Massa has the unique opportunity of taking the drivers’ crown in front of his adoring and passionate Brazilian fans. Only victory will be good enough, as nothing else will do. The Ferrari driver needs all the support and probably luck in order to win his first title. But saying that, the young Brazilian has a fantastic record around Interlagos. In 2006, Massa won his second Grand Prix in style with a dominant performance in front of his home crowd. Doing so, Massa became the first Brazilian driver to win at Interlagos since the late, great Ayrton Senna took the honour back in 1993. The following year, he was leading the race comfortably but pulled over to let his team-mate Raikkonen through for the Finn to take the championship away from the McLaren pair (Alonso and Hamilton). He finished second in that race. And now with the championship poised with a climatic finale this year, Massa will be determined to score a perfect result with race victory. He will have the support of team-mate Raikkonen and Renault’s Fernando Alonso, but it will be all down to him to perform in qualifying and in the race. Here’s hoping Felipe will have a clean fight with Lewis with a fast, consistent car with no pit stop ‘dramas’ that could hinder his attempt to win. So who will win the ultimate prize in Formula One? The British public and media will want Lewis to take it after his impressive performance this season and with a seven-point advantage, he can afford to take the conservative approach to land the title. But he is a racing driver after all and the overall victory is what matters, so don’t be surprise if he goes all out for the maximum ten points! Only fifth place or higher will get the job done, so keep that in mind Lewis. Personally, I like to see Massa to triumph, as he is the most improved driver in 2008. Yes, he had made some errors including spinning off no less than five times in the soaking wet British Grand Prix at Silverstone(!) but I truly believe he has the ability to cast aside his doubters/critics with a strong result at his home circuit. We shall find out who will be spraying the champagne on Sunday evening. Let battle commence! If you haven’t heard Alison Goldfrapp’s sensational singing voice, then here’s your opportunity to listen and download classic anthems for free – all thanks to The Guardian website. The leading news website will feature a new track everyday for only this week to celebrate the release of the Seventh Tree Special Edition album, out on November 3rd. 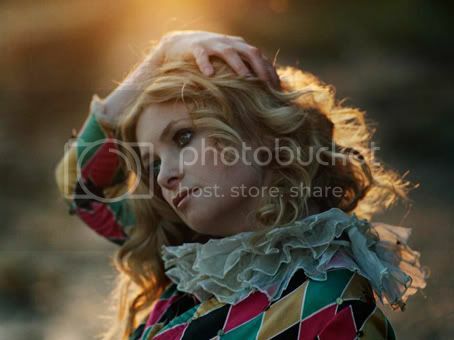 I am a big fan of Goldfrapp. I’ve been to two live shows earlier this year and it was fantastic, in particular at the Royal Festival Hall on the Southbank. Why do I like Goldfrapp? I just love the different music styles. From the ambient sound in Felt Mountain (Alison’s distinctive breathy, soft vocals and Will Gregory’s multi-layered synthesizer and string arrangements is simply spellbinding! ), through to electronic music in Black Cherry to a more glam rock sound in Supernature, and most recently to a blend of ambient, folk, and electronic in Seventh Tree. I was quite jealous of my work colleagues last week as they had tickets to see a one-off performance at Cecil Sharp House in Camden. The show was recorded as part of the BBC Electric Proms and you can see why I was envious by watching the video and observing the many photographs with this dedicate website. Feeling left out in missing the event, I immediately booked some tickets after an email dropped into my Google inbox with the news that the band will be playing in Brixton Academy next month. I’ve never been to Brixton Academy before and have heard that this venue is the best place to see live acts. Funny enough as I write this post, I just received my tickets for the show in the mail today (October 29th). And with that note, it’s time to celebrate with this awesome theme tune! Lewis Hamilton answered his critics with a commanding drive in Sunday’s Chinese Grand Prix, with a lights-to-flag victory, his fifth Grand Prix success this season. The McLaren driver withstood pressure from the two Ferraris of Felipe Massa and Kimi Rakkonen with ease, lapping consistently and making no mistakes. In fact, Lewis dominated the Chinese Grand Prix weekend with fastest laps in the opening practice sessions, taking pole position and setting the race’s quickest lap. Victory was the perfect result for the Briton. Hamilton can win the drivers’ title if he finishes no less than fifth in Brazil in two weeks time and the pressure is on Felipe Massa, as this is the Brazilian’s home race. Sunday’s result in Shanghai was a very disappointing result for Massa, as he struggled to match the strong pace from his title rival, but at least he still has the chance to take title in Sao Paulo. Though the odds are looking long for Felipe. Kimi Raikkonen finished in third after giving chase to Lewis Hamilton since lap one. The Finn was unable to stop the pace of the leading McLaren and in the closing stages of the Grand Prix, Raikkonen handed over second position to his Ferrari team-mate Massa, to help out the Brazilian in his bid for the world championship. Despite giving way, by finishing second and third Scuderia Ferrari extend their constructors’ championship lead over McLaren-Mercedes with only one race remaining. Double world champion Fernando Alonso finished fourth for Renault. The Spaniard briefly lost the place to McLaren’s Heikki Kovalainen through the first few corners, before repassing the Finn into the hairpin further around the opening lap. Alonso couldn’t repeat his success in Singapore and Japan, however his strong finish in the top six means he has secured the Renault team’s fourth place in the constructors’ championship. Kovalainen fell behind the Renault after being overtaken and although he might have had the opportunity to fight back by running a longer fuel strategy at the final pit stop, that right-front puncture on lap 34 destroyed his chances of a decent points finish. The Finn was able to get back to the pits for some new Bridgestones but by then, he lost track positions and was forced to retire with six laps left to the chequered flag. This was a bad result for Heikki, as Lewis Hamilton and the team needed him to help out in winning the two titles. The BMW Sauber pair finished in the top six with Robert Kubica using a long opening stint to regain lost ground after a disappointing qualifying session in which he started 11th. Kubica finished close behind his team-mate Nick Heidfeld (who was penalised for impending David Coulthard during qualifying), but by finishing in sixth the Pole is now out of the running for the drivers’ world championship. Timo Glock used a one-stop strategy to take seventh for Toyota, ahead of Renault’s Nelson Piquet Jr, who also gained track positions by adopting a very long first stint. Scuderia Toro Rosso’s Sebastian Vettel finished in ninth, ending his impressive points scoring run since the European Grand Prix while David Coulthard in the main Red Bull-backed car, was tenth. So Lewis Hamilton will take a seven-point advantage into the final round of this season’s Formula One World Championship. The McLaren driver can afford to take a conservative approach by not risking for the Grand Prix victory in Sao Paulo next month with either fifth position or better will get the job done. For Felipe Massa, the pressure is on his young shoulders and the Brazilian will need home and team support if he has the chance to take the title for himself. The conclusion to this year’s world championship will be thrilling, unlike the race itself in Shanghai. Who will win their first drivers’ crown? Roll on November 2 in Interlagos, Sao Paulo to find out! Lewis Hamilton boosted his world championship prospect of claiming the drivers’ title by taking a vital pole position in the Chinese Grand Prix at the Shanghai International Circuit. 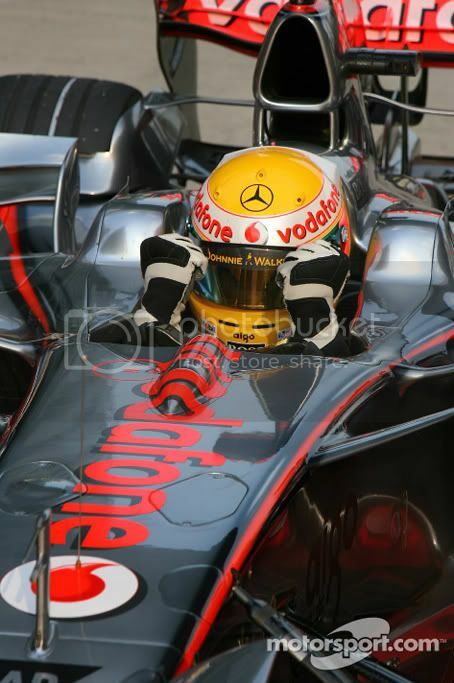 Though at one point in the all-important top-ten shootout, the McLaren driver was in a provisional fifth after making a mistake during the middle sector on his first run in Q3. Lewis was able to recover with style by securing the top spot by over three tenths of a second beating crucially the two Ferraris of Kimi Raikkonen and Felipe Massa, second and third respectively. Hamilton had earlier dominated the two Friday practice sessions with his impressive speed around the 3.387-mile race track. He continued this strong pace into qualifying and by taking his 13th career pole with a time of one minute, 36.303 seconds; the Briton has the best opportunity in taking his first drivers’ championship in China this weekend. Hamilton’s main title rival Felipe Massa could only managed third while Robert Kubica – who was an outside contender for the title – ended up in a disappointing 11th position on the grid. The BMW Sauber driver had been unhappy since opening practice complaining about the car’s balance and by starting in 11th position – the worst qualifying position in his Formula One career – Kubica’s chances of fighting for the title is now effectively over. Double world champion Fernando Alonso will start in fourth for Renault and earlier this week, the Spaniard has vowed to help out in every opportunity for Ferrari and Massa to win the world championship. What could Alonso do in China? Can he go for a third straight victory? Lewis will better watch out from his old nemesis and it certainly didn’t help that his McLaren team-mate Heikki Kovalainen ended up in a disappointing fifth. The Finn had held provisional pole early in Q3, but was unable to improve on his second run and fell four places. Red Bull Racing’s Mark Webber took sixth, but will lose the place and drop down to 16th because of his engine-change penalty incurred when his Renault V8 blew up in practice. This elevates Nick Heidfeld into the top six for BMW Sauber but was later penalised for impending Webber’s team-mate David Coulthard in Q1! So sixth place went to Sebastian Vettel for Toro Rosso, with his team-mate Sebastien Bourdais in eighth. Between them is Toyota’s Jarno Trulli. And rounding out the top ten is a penalised Heidfeld with Nelson Piquet Jr lining up alongside for Renault. Sunday’s Chinese Grand Prix could be the race in which Lewis Hamilton could seal his first drivers’ title providing he finishes at least six points ahead of Felipe Massa. The Briton will be hoping he can eliminate that costly error in last year’s Grand Prix when he retired in the gravel trap after staying out too long on wore-out Bridgestones… Can Lewis do it and score that all-important title? Or will the Ferraris of Raikkonen, Massa and possibly the joker in the pack, Alonso stop his dream of claiming the championship? Let’s see on race day. *Drops three places because of impeding another driver in qualifying. **Drops ten places because of an engine penalty. Double world champion Fernando Alonso scored his second consecutive Formula One victory – his twenty-first in his career – with an impressive display in the Japanese Grand Prix at the Fuji Speedway. The Renault driver benefitted from the two championship contenders, Lewis Hamilton and Felipe Massa, when the pair was both compromised with drive-through penalties in the incident-packed race. The McLaren driver was accused of pushing off Kimi Raikkonen at the first corner with his desperate late braking move, while the Brazilian was given the penalty when he collided with Lewis at the chicane… Both were able to continue and it was Felipe who managed to pick up points with eighth. Hamilton finished outside the points with a frustrating 12th. But it was Alonso who took the winner’s trophy after his flawless performance in the R28. The Spaniard was lapping with so much consistency that he was able to leapfrog ahead of Robert Kubica by making his first fuel/tyre stop one lap later than his BMW Sauber rival. That extra pace made the differences for Alonso to see off the challenges of Kubica and the reigning world champion of Kimi Raikkonen to the chequered flag. This race victory at Fuji follows on from the Spaniard’s breakthrough win at Singapore’s night race last month. But instead of the Safety Car giving him the helping hand, Alonso won the Japanese Grand Prix by pure speed alone and that is an impressive achievement, especially if you consider how the team/car performed earlier this season. That first lap was highly controversial as it made a heavy impact in terms of the drivers’ championship. As he dived for the inside, smoke pouring from his locked wheels in a desperate bid to get back the lead (he flat-spotted both Bridgestone in this move). He made no attempt to take the corner due to his excessive speed. In a brief moment of despair Lewis nearly collided into his own McLaren team-mate Heikki Kovalainen on the run down to the first corner, determined to regain his lost lead. In turn one, Lewis ran wide forcing both him and Kimi Raikkonen on the outside. Felipe Massa, who started in fifth, and Kovalainen both went off in avoidance. That first-corner chaos allowed Kubica and Alonso to slip into first and second ahead of the recovering Kovalainen, while Massa, Hamilton and Raikkonen fell back into the traffic. Both Hamilton and Massa would later receive drive-through penalties for their respective aggressive moves, consigning the title contenders to unproductive afternoons in the midfield. “He (Hamilton) braked very late and I braked very late, and then I was a little bit wide in the first part of the corner,” explained Massa. “Then he had my inside line and pushed me a little bit wide in the gravel, and then I went with the wheels on the gravel but the next corner was on the left. “Then we just touched each other, so in my opinion it was a racing incident. As for Lewis Hamilton, he regrets that first corner move as a ‘mistake’ and vowed to recover by winning the remaining two Grands Prix for the championship. But while he admitted his move on Raikkonen was incorrect, Hamilton was not happy that he received an equal penalty to Massa. These two incidents have made an impact to the drivers’ standings following the race at Fuji, with Massa reducing the deficit to Hamilton from seven to six points. The McLaren driver still has 84, while the Brazilian has 78 points with two races left. Meanwhile in the constructors’ championship, the non-finish for Heikki Kovalainen – who was delayed at the first corner and was on course for race victory but was forced to stop early by mechanical failure – meant Ferrari regained the lead thanks to Kimi Raikkonen’s third-place finish. The Scuderia Ferrari leads McLaren-Mercedes by five points (141 over 135) with BMW Sauber a close behind with 128 points. 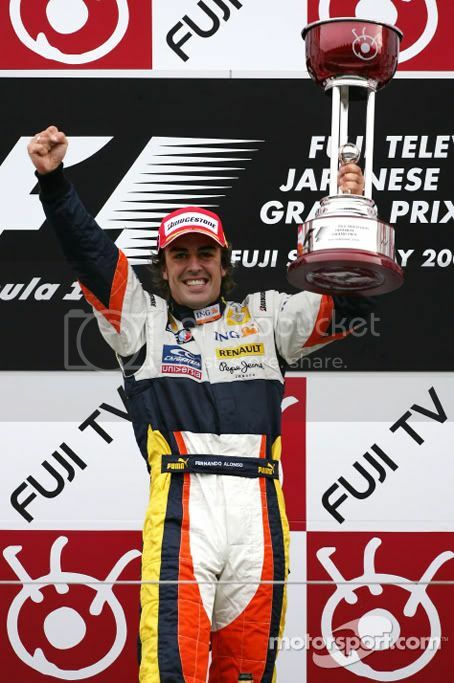 As for the top ten finishers in this Japanese Grand Prix at the Fuji Speedway, Nelson Piquet Jr capped off his difficult rookie season with a fine fourth. At one point, he was leading the race and time will tell if the young Brazilian can keep his seat at Renault next year. Jarno Trulli drove a strong race all afternoon to finish in fifth at Toyota’s home circuit. Scuderia Toro Rosso got both cars into the points, with Sebastien Bourdais and Sebastian Vettel coming home in sixth and seventh position, ahead of the recovering Massa, who at least reduced Hamilton’s lead to six points. The Brazilian managed to salvage a point despite spinning when he banged wheels with Bourdais as the Toro Rosso rejoined following its final pit stop – an incident that will be investigated by the stewards after the race. The Ferrari survived that tangle and produced a series of late passes to claim eighth, with Red Bull’s Mark Webber his final target. 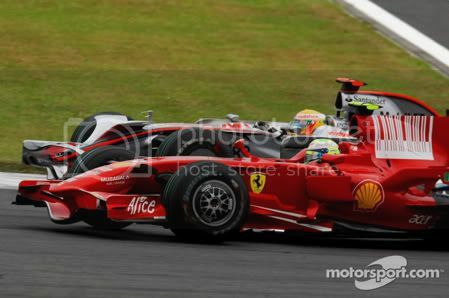 The Australian had driven well on a one-stop strategy, but couldn’t fend off Massa in the closing moments of the race. Nick Heidfeld also used a one-stop plan to progress to tenth, but must be disappointed by the lack of pace compared to team-mate Robert Kubica. The sole Japanese driver in the 20-car field, Kazuki Nakajima, saw his first home race ruined at the start, when he lost his front wing on David Coulthard’s Red Bull as it veered across his path after a dramatic suspension breakage. Coulthard, who suspected his suspension had been weakened in the first corner wheel-banging chaos, slammed into the barriers but was unhurt. Next weekend is the Chinese Grand Prix at the Shanghai International Circuit. Only six points separate the two title contenders and already Lewis Hamilton is stating the fact that he will win the race following his disappointing performance at Fuji. Providing he doesn’t make another mistake like last year or take any risks, the McLaren driver should have the advantage as this exciting season of Formula One racing draws to a close. 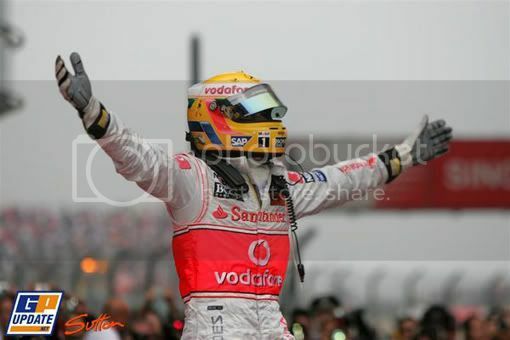 Only Ferrari can prevent Lewis on winning the title and it will be fascinating to see what happens in seven days time! Championship leader Lewis Hamilton will start the Japanese Grand Prix from an ideal position with pole at the Fuji Speedway. His main title contender Felipe Massa slipped down to fifth in the closing moments of qualifying after Renault’s Fernando Alonso and McLaren’s Heikki Kovalainen set quicker laps. With Hamilton out front (his sixth pole position this season), the McLaren driver will have the advantage of extending his points lead as the championship reaches its dramatic conclusion. His lap time around the Fuji Speedway was an impressive one minute, 18.404 seconds – which was two tenths faster than the reigning world champion Kimi Raikkonen (one minute, 18.644 seconds). The Finn seemed to be in a more competitive mood after recent struggles in qualifying and by starting in second place (his best since the French Grand Prix way back in June, where Kimi was on the front row), the Ferrari driver will have a good opportunity of challenging Lewis for race victory. His Scuderia team-mate Felipe Massa will have a difficult afternoon on race day following his disappointing fifth position (his time was one minute, 18.874 seconds). The Brazilian was unable to make the most of his Bridgestone in the final qualifying runs during Q3 and will be hoping he has the pace to fight during the 67-lap Grand Prix. Between the two red cars are Renault’s Fernando Alonso and McLaren’s Heikki Kovalainen. The pair recorded their best times in the final moments of Q3 with one minute 18.852 seconds and one minute, 18.821 seconds respectively. Singapore Grand Prix winner Alonso was quite pleased by his qualifying result and a top-five finish is on the cards for Sunday. For Heikki, playing the team role of supporting Lewis Hamilton in his title bid, this third place grid start is perfect for the Finn to help his team-mate and extend McLaren’s lead in the constructors’ championship. Robert Kubica will start the Japanese Grand Prix in sixth while his BMW Sauber team-mate Nick Heidfeld finished way down the order with a frustrating 16th. This was Nick’s worst qualifying result this season and it didn’t help that neither BMW show any competitive pace. Toyota locked out the fourth row at their home circuit, with Timo Glock only eighth behind his team-mate Jarno Trulli despite going fastest of all in Q1. The Toro Rossos completed the top ten, with Italian Grand Prix winner Sebastian Vettel beating team-mate Sebastien Bourdais to ninth by half a second. Sunday’s Japanese Grand Prix promising to be a thriller and with Lewis Hamilton out in front and main title rival Felipe Massa down four places, the McLaren driver will have the advantage in extending his championship lead. Only Kimi Raikkonen, the out-going world champion, can prevent Lewis on winning and the Finn will need to dig deep in order to win his first race since the Spanish Grand Prix back in April. My recent trip to Germany was a real eye-opener. I never seen so many fascinating places of interest, with its rich history and heritage, plus the difference in culture between the British and German was deeply interesting. I’ve managed to get by the language barrier as many Germans can speak English, so that was particular useful when ordering food! I always wanted to visit the country since my sister lives and work there. 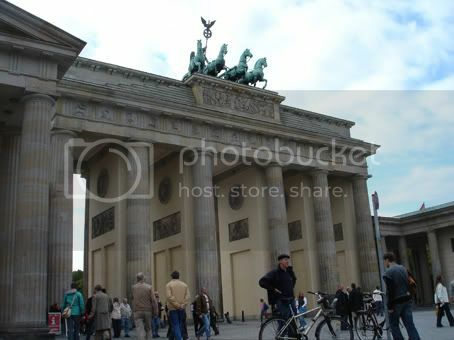 My parents went earlier this year but I was unable to go due to the amount of work I had to do… I have made amends by suggesting to my mates to tag along by visiting Berlin (the capital city of Germany), Aschaffenburg (my sister’s home town) and Munich (for the Oktoberfest).